Petite Lemon M is for Maverick from the Monster Monogram line! What young child would not go monster crazy for a Monster Monogram tshirt? It comes in every letter of the alphabet, each letter being a different monster. Now these are cute monsters so no worries. The M reminds me of a monster jellyfish. Maverick is rockin' this shirt from Petite Lemon and he got a lot of attention when he wore it to church. It was a hit and several gals asked me where I got it! I think this shirt would be a hit for just about any aged child but especially the 3-8 aged group. Cute for girls as well! This is just one of the many Personalized products that Petite Lemon has available for purchase. They also carry Growth Charts, Prints & Posters, Notecards, and gifts. A huge selection of quality products to showcase your child's personal style. Some of my other favorite shirts are in the Big Brother or Big Sister line, great for announcing your upcoming addition to the family! I enjoyed sharing our 'news' with my parents through a shirt my children wore. That is so much fun! And then they can wear the shirt afterward as well. Need a shirt for a special birthday? 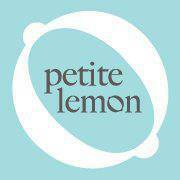 Petite Lemon has you covered on that front as well. Their shirts are digitally printed on soft, high quality t-shirts. You can choose short or long sleeved. These shirts are super comfy! Truly a great fit and a quality product!